On Monday morning, Moto 360 owners couldn’t help but take to the internet to talk about the “dramatic” increases they were now seeing with their smartwatches thanks to an update that rolled out to the masses on Friday. Even Tim pinged me that morning to mention that the 360 was a “bossy little watch now” because of the battery life he had witnessed over the weekend. After posting about the potentially amazing news, our comments filled up with others who were experiencing similarly extended single-life charges. Some were even considering switching Ambient Mode back on. Seriously. With that thought in mind, we decided to test the Moto 360 for a couple of days with Ambient Mode on, because well, Ambient Mode is just that much cooler. While there isn’t much of a reason to leave your watch’s display on at all times other than to no longer have to rely on the watch recognizing that you want to see it with wrist movement, the thought of being able to run the watch with it’s display on at all times and have it last a day, something that wasn’t previously possible, is kind of exciting. So what did we find? In two days of testing with Ambient Mode turned “on,” I was able to take my Moto 360 off the charger in the morning and carry on for a full 13 hours before it warned me about an impending battery death. And keep in mind that I was trying to use the 360 as much as possible, to really put it through its paces. I was pushing notifications left and right, responding to Hangouts messages with my voice every chance I could get, and making sure I looked at as many cards as possible before swiping them away. On day 2, I even put the 360 through a factory reset mid-day because I needed to attach it to a new phone. As you can see in the two photos below, which are both after around 13 hours of use, I still had enough juice left that I could have potentially gone for another hour or two. So we are talking 13-15 hours of use with Ambient Mode on after the update, whereas we were only seeing 10-12 before. Tim saw similar results in his tests. 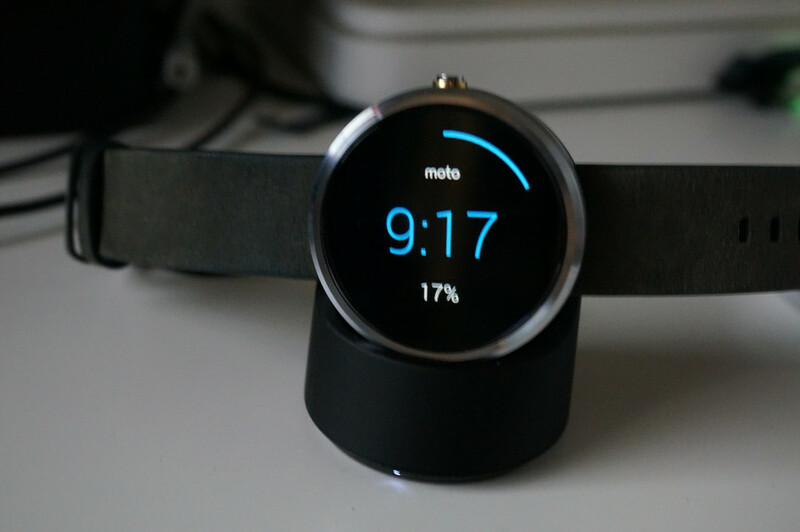 Over the weekend, with Ambient Mode still “off,” he went two days without having to charge his Moto 360. 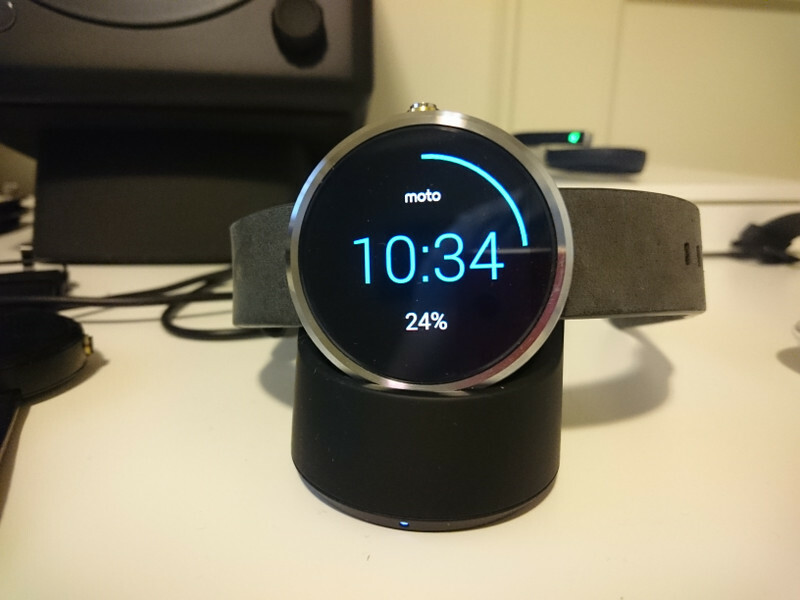 On Monday night, with Ambient Mode “on,” he ran his Moto 360 from 9AM to 11PM and had 5% battery remaining. While I haven’t had a chance to test with Ambient Mode “off,” many are reporting two-day battery life. Many. This update appears to be a massive success. 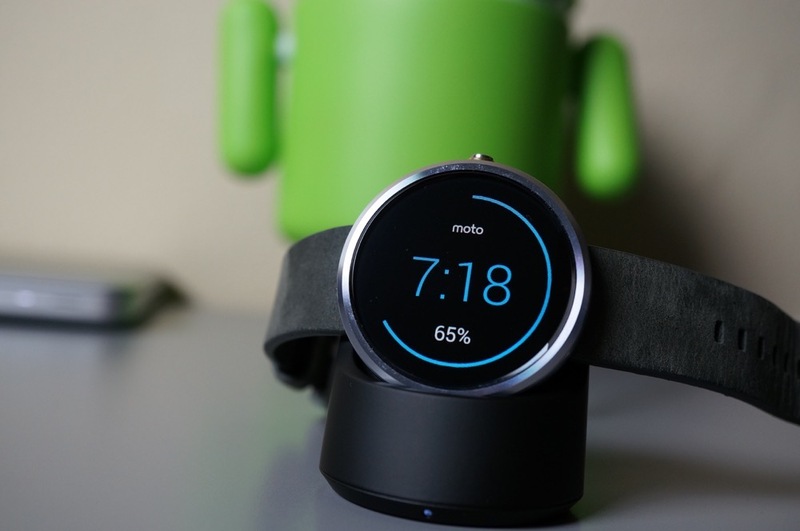 Hopefully, you were able to get in on yesterday’s Moto 360 re-stock.